This post is catered to those who need help in dealing with activation or software update on the #Apple iPhone 7 Plus (#iPhone7Plus). Several factors can hinder both activation and update processes in mobile devices like Apple’s latest flagship smartphone. Network problems appeared to be among the most common culprits. There are also other cases where device activation and iOS update problems are tied to a faulty SIM card and server issues. Error codes and message prompts will help you determine as to what caused you trouble activating or updating your iPhone software. Therefore, you should never disregard any alert messages you see should you encounter problems while attempting to activate or update your iPhone 7 Plus. If you come across this page while searching for solutions to a similar issue on the same device, then you might as well consider reading this entire content and try any of the applicable workarounds as subsequently demonstrated. As to our readers who have other issues, visit our iPhone 7 Plus troubleshooting page for we have already addressed a lot of issues with this device. There could already be existing solutions to your problems so try to find issues that are similar with yours but if you need further assistance, then feel free to contact us by completing our iPhone issues questionnaire. What to do if you cannot activate your iPhone 7 Plus? So you finally get your own share of Apple’s latest flagship smartphone, the iPhone 7 Plus but only to get disappointed because for some reasons, you cannot activate your device. Before you get hysterical and demand for a unit replacement, you can try the following workarounds to fix the problem on your end. 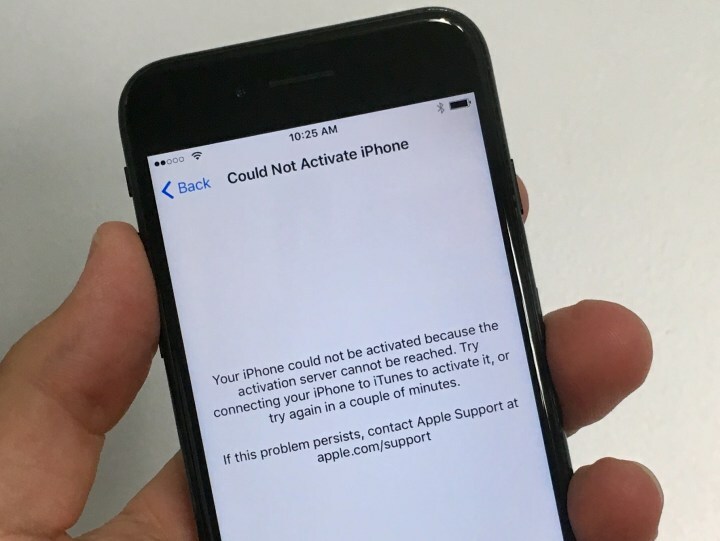 Usually, you will be prompted with a message saying that your iPhone cannot be activated due to unavailability of the activation server, unsupported SIM card, or activation couldn’t be completed in the meantime. And as I’ve said earlier, never disregard any of these messages for they will serve as clues for you to know the underlying cause and so from there you will know what to do next so as to get the problem fixed, proceed with the activation and finally get your new iPhone all set for use. Step 1. Check your iPhone and see if it uses a SIM card. If your iPhone uses a SIM card, check and ensure that the SIM card is properly inserted in your device. Your iPhone might still need the SIM card to activate even without an active contract. Usually, you will see a No SIM or Invalid SIM alert when the SIM card is damaged, locked, or missing. Make sure that your wireless plan is already active. You may need to contact your carrier for account verification. Turn Airplane Mode on and off. Toggling the Airplane mode switch on and off can also help rectify such glitches. To do so, go to Settings-> Airplane Mode. Toggle the switch to turn it on and after 10 seconds, turn it back off. After doing that, try to update your iPhone software again. Restart your iPhone. To restart, press and hold the Sleep/Wake button until you see the slider. Drag the slider to turn your iPhone off completely. After 30 seconds, press and hold the Sleep/Wake button until the Apple logo appears. Once your iPhone boots up completely, you can retry updating iOS. Check for carrier settings update. Navigate to your iPhone Settings-> General-> About. You will see a prompt to select OK or Update if an update is available. Remove and re-insert your SIM card. You will need a paper clip or SIM eject tool for this. Make sure that the SIM tray is completely closed and not loose. Also ensure that the SIM tray is inserted in the same orientation that you removed it. And as much as possible, use only the SIM tray that came with your iPhone 7 Plus. Try using another SIM card, if available. This will help you isolate the problem and determine if it is due to a bad SIM card. If you’re still getting a SIM card error, contact your carrier for further assistance. Step 2. Check and ensure that the server is active. As mentioned above, one of the possible reasons as to why you cannot activate your iPhone is due to server unavailability. To make sure this is not causing you trouble, go ahead and check on the Apple Support system status page and then look for iOS Device Activation. A green box next to iOS Device Activation is an indication that the service is available and you should be able to proceed with the device activation this time. If it does not appear green, it means that the service is currently unavailable so you can try activating your iPhone at a later time. Step 3. Enter the correct password, if necessary. Usually, you will be prompted to enter a password if Activation Lock is enabled in Find My iPhone. In this case, all you need to do is to provide the correct password for your Apple ID account in order to proceed with your iPhone activation. Step 4. Restart your iPhone. Turning your iPhone off and then back on for a few seconds can also help resolve minor software glitches that may have prevented you from activating your iPhone. So to ensure you’re not missing a thing, try restarting your iPhone once, twice or even three times this time. Step 5. Switch network connection type. If you are using a cellular data connection while attempting to activate your device and then it won’t go through, try switching to a reliable wireless network instead. If Wi-Fi connection does not work either, try activating your device using iTunes. When using iTunes to activate your iPhone, make sure iTunes is updated. If you are prompted with a message saying that you need to sign in with an Apple ID to activate your device, then most likely the Find My iPhone Activation Lock feature is enabled on the device thus you are required to enter your Apple ID and password to activate and use it. If the problem persists, contact your carrier for further assistance on checking for network or activation issues. You can also try to ask for SIM card replacement if necessary. What to do if you cannot update your iPhone 7 Plus software? Keeping your iPhone operating system up-to-date is highly recommended to ensure better and more optimized functionalities on your device. However, there are times when you couldn’t update your iPhone software no matter how much you tried. Keep reading to learn how to deal with this issue should you encounter it in the future. Apple has just released iOS 10.2 for iPhone and iPad devices. It contains several enhancements to your iPhone functions including the TV app, enhanced photos, messages, music, news, mail, accessibility, and more new emoji items. The new iOS update also integrates other functionality improvements as well as fixes to existing software bugs and issues on certain iDevices. Note: If possible, be sure to secure a recent iCloud backup of your device. To confirm, tap Agree again. After that, the download will automatically instigate. If you are prompted with a message saying “Preparing to download” and the download does not start right away, just give it a few minutes and the download should start shortly. Alternatively, you can install iOS 10.2 on your iPhone 7 Plus using iTunes on your Mac or Windows computer, especially if you have limited space on your device or the software update is not working for some reasons. But if you still cannot update your iPhone software, here’s another option you can try on. Try to use recovery mode to set up your iPhone again. On your computer, open iTunes. Again, make sure you are using the latest version of iTunes to avoid any problems due to software incompatibilities. While your iPhone is connected, perform a force restart. A force restart is done by pressing and holding the Sleep/Wake and Volume Down buttons on your iPhone simultaneously. Do not release both buttons when the Apple logo appears. Keep holding them until the recovery mode screen shows up. When you are prompted with the option to Restore or Update, select Update to continue. Wait for iTunes to try to reinstall iOS without erasing your data and download the software for your iPhone. In case the download takes over 15 minutes and your iPhone exits recovery mode, just let the download process to complete and then repeat these steps. Once the Update is finished, you can proceed with your iPhone setup. If there is no way for you to use recovery mode due to damaged or stuck buttons, contact Apple support to escalate your concern and ask for further assistance and recommendations.